Nathan Cleverly is hoping to finally face Juergen Braehmer, five years after the pair were first due to fight. Braehmer, 37, is without an opponent for his WBA light-heavyweight defence on March 12 in Germany, and the Welshman is keen to fill the vacancy. Former WBO champion Cleverly, 28, says his promoter Eddie Hearn is talking to Braehmer's promoters, Team Sauerland. "I want the fight, definitely, I'm very up for it. It's a fight that should happen," he told BBC Radio Wales. Cleverly has not fought since his points defeat against Andrzej Fonfara in October, a contest where he suffered a broken nose, but also received plaudits for his battling performance. He is keen for the match to be made, and has no concerns about travelling to fight the champion in his home country. "It's a good challenge and hopefully the promoters can do the deal," he said. "I'm ready to strike and I know Eddie Hearn has a good relationship with the Sauerland's, so let's get this fight on." 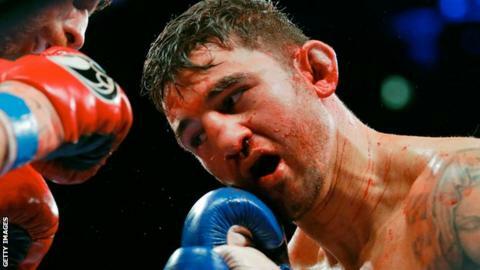 Cleverly made his comeback at light heavyweight with a 24-second stoppage of Czech journeyman Tomas Man in May after losing to bitter rival Tony Bellew at cruiserweight. Braehmer was due to fight Cleverly in 2011 but pulled out injured, which saw the Cefn Fforest fighter inherit his WBO title. "I was meant to challenge him in the past and it just didn't happen. Then it was on for London, he pulled out days before the fight," Cleverly said. "Now is the right time and this fight needs to happen. "I've been ticking over in the gym, I'm just waiting for that call. Go to Germany on six weeks' notice? No problem. I'll be ready to go to war as soon as I get the call to say let's get it on." Cleverly successfully defended his world title five times before losing to Sergey Kovalev in August 2013.